A lot of things have come together for me in the past few days. Yesterday we observed Tisha b’Av, which brought to mind the sinat hinam, pointless hatred among Jews, that Jewish tradition blames for the destruction of the Temple and the dispersal of the Jewish people. At the same time, I am reading Michael Oren’s account of his time as Israel’s ambassador to the US, and taking particular note of his observations about the tension between American Jews and Israel – a subject I’ve written about in the past and one that continues to impose itself on me, especially now that the action of the US Congress on the Iranian nuclear deal may depend on one Jewish senator – Chuck Schumer – and his Jewish constituents. Almost exactly a year ago, my grandson Max became bar mitzvah, in California. It was a very emotional experience because Max has Asperger’s syndrome, a mild form of autism. We didn’t know if he would be able to concentrate well enough to prepare himself, or be able to perform in front of the congregation. But no one who saw it will ever forget the look on his face when he got to the next to last sentence in his haftorah and realized that he was going to make it. Today I went to another bar mitzvah celebration. The young man is also on the autism ‘spectrum’, as they say. Yuval’s disability is more severe than Max’s, and he is unable to speak. He was, however, able to voice the brachot to bless the Torah by using an electronic device, which is why he did it on a Monday instead of on Shabbat. There is a long story behind Yuval’s bar mitzvah. He goes to a school for children with autism which is supported by Israel’s Education Ministry and the city of Rehovot. 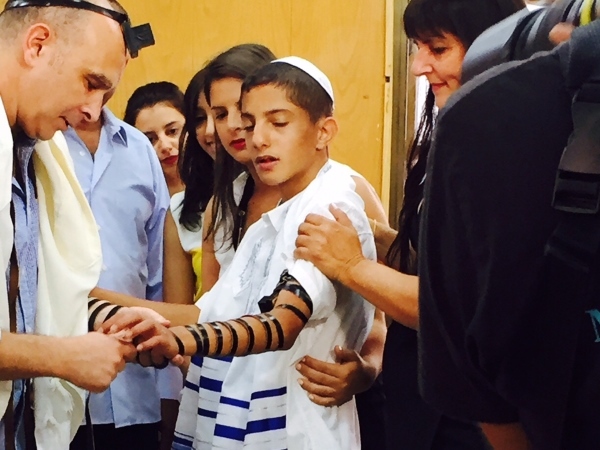 He and several others from the school were scheduled to become bar mitzvah at a special service in our Masorati (conservative) synagogue last month, part of a program that the Masorati movement has had for 20 years. But haredi parents of other children in the school complained to the head rabbi of Rehovot, and the mayor of Rehovot – a former member of the Knesset for the Shas party – intervened to prevent it. An event was held at an Orthodox synagogue, but it was on a Sunday and the Torah was not read (see here and here). It was not even a minimal bar mitzvah, and the Masorati rabbi wasn’t invited or informed. Yuval’s family later arranged for the bar mitzvah to take place as a private event after the end of the school year. This morning I heard on the radio that participants in a Tisha b’Av evening service at a Masorati synagogue in Modi’in, near Jerusalem, found themselves locked in after heavy pots were placed against the door. The hostility shown by the Orthodox establishment and by some individuals to any non-Orthodox expression of Judaism in Israel is not new. I was recently shocked to hear that an acquaintance’s father – Orthodox, but not haredi – was in the habit of spitting when he passed the Masorati synagogue in Rehovot. Spitting! And I can’t count the number of times I’ve heard all non-Orthodox Jews referred to as “reformim,” despite the fact that the gap in theology and observance between Masorati and Reform is far wider than that between Modern Orthodox and Masorati. I understand that the non-Orthodox movements haven’t gotten much traction in Israel, except among immigrants from English-speaking countries (this is changing, albeit slowly). There are lots of reasons for this. Secular Israelis associate religion of any kind with the oppressive rabbinut, the government mandated religious establishment that administers conversion, marriage, divorce and burial in a cynical and even corrupt way. Outside of Israel, non-Orthodox Judaism enables those who don’t have a Jewish education or knowledge of Hebrew to participate; here, everyone knows Hebrew. And – not a small thing – Orthodox synagogues get government funding. Israelis also may not want to participate in a movement that they feel is directed from abroad by people who don’t understand Israeli reality. Nobody has been more critical of the Reform movement in America as I have, for their (in my view) replacement of Jewish ethics by shallow humanism and left-wing politics. It is infuriating when Reform Jews in America play directly into the hands of Israel’s enemies by attacking the Jewish state for being ‘undemocratic’ because it doesn’t share their priorities. And it is flat-out dangerous when they finance groups like the New Israel Fund which promise to make Israel more ‘democratic’. But there is way too much sinat hinam around here. Minister of Religious Services David Azoulai, from Shas again, who recently said that Reform Jews are not Jewish, needs a lesson in both halacha (Jewish law) and derech eretz (civilized behavior). The situation in which the rabbinut is allowed to continue, even expand, its monopolies drives a wedge between the observant and secular population. The question of national service for haredim makes it wider. We made a tiny start with the last government, and now Shas and UTJ are back in the coalition and nothing will happen. I know that there are bigger issues. There’s Iran. There’s Obama. But this problem is always pushed aside, this can always kicked down the road. It was never a big issue for me. I always thought that Israel should concentrate on security and the rest can be worked out. I always thought that the issue of ‘pluralism’ was just something invented by leftist American Jews to give Israel a hard time. But now I am beginning to see that it is not so. The intolerance for fellow Jews shown by some other Jews is nothing other than sinat hinam, baseless hatred. And the damage it can do is incalculable. The key to solving this problem isn’t in the hands of the non-Orthodox Jews or the secular ones. The only way to fix it is for respected leaders in the Orthodox community to face it head on, to see it for what it is and to start talking seriously, not contemptuously, with the non-Orthodox. May they do it before next Tisha b’Av. You are of course right about the importance of showing tolerance and understanding for different streams of Judaism. This relates to a broader problem of close- mindedness and ignorance on the part of many religious groups. There is no way these people can become ‘tolerant and understanding’ without opening themselves to question and doubt. And of course ‘question’ and ‘doubt’ is what they fear. This is an extremely important problem for Israeli society as a whole as the proportion of these groups in the population is growing. I know no one and no way of really contending with this.